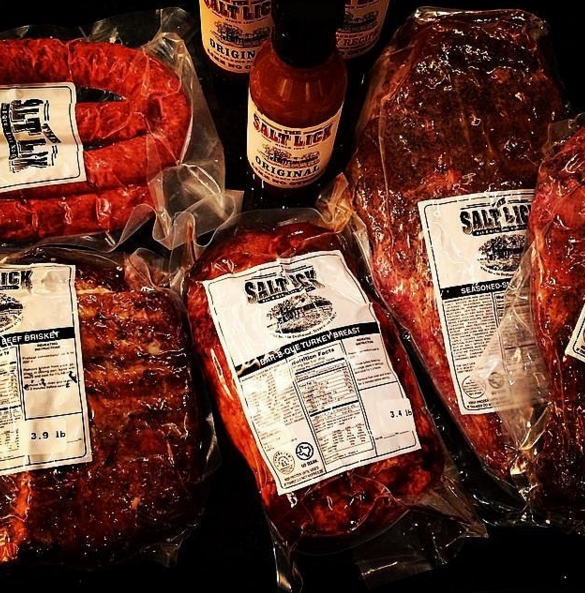 The roots of The Salt Lick run back to Mississippi in the mid-1800s. Scott Roberts, the current owner of the Salt Lick, had a great-grandmother, Bettie Howard, who came to this land from Desoto, Miss. in 1867. James Howard was a surveyor passing through Desoto. Bettie was a 14-year-old orphan looking for a way to survive. She told James that she couldn’t promise she would ever love him. But she said that if he would marry her and take her to Texas, she would bear and raise all his children. James took Bettie up on her offer. After crossing the gulf from Biloxi with their wagon in pieces on a boat, they landed in Indianola, Texas and reassembled their wagon. On the trip by wagon train to Driftwood, Bettie barbequed meat by searing it and then slow cooking it over coals – the same method the family uses today. When Bettie arrived in Central Texas, she proved to be a woman of her word. She populated her new hometown of Driftwood with nine Howard children. Roxanna, one of Bettie’s daughters, raised Scott’s father, Thurman, in Driftwood. But Uncle Sam recruited him for service in the Navy. The Texas boy wound up stationed in Kauai. There he met his wife Hisako who was born on Kauai of Japanese descent. In 1956, Scott’s mother and father moved with their two young sons to Driftwood. But his father had to travel constantly across the state working for a bridge construction company. Thurman dreamed of spending every day where his family had put down generations of roots. One day he and Hisako took out a yellow legal pad and wrote down 54 things the family could do and stay in Driftwood. The idea for the Salt Lick was 14th on the list. At first, they irrigated a field and truck farmed, selling produce to local grocery stores. They also made candies, raised pecan trees and had a shelling business. But in 1967, Thurman, who was known for his delicious barbeque at family reunions, decided he would cook meat for paying customers. Thurman and his two sons built a huge barbeque pit. Thurman would go to the pit on Thursday night and start cooking. He stayed for the weekend, sleeping on a cot, until all the meat sold. He kept coming home earlier and earlier. After a few months, the boys and Thurman built a little screen porch around the pit. The Salt Lick has grown from there. The Roberts family now serves mouthwatering barbeque to thousands of folks each week. Driftwood is open every day 11am to 10pm. 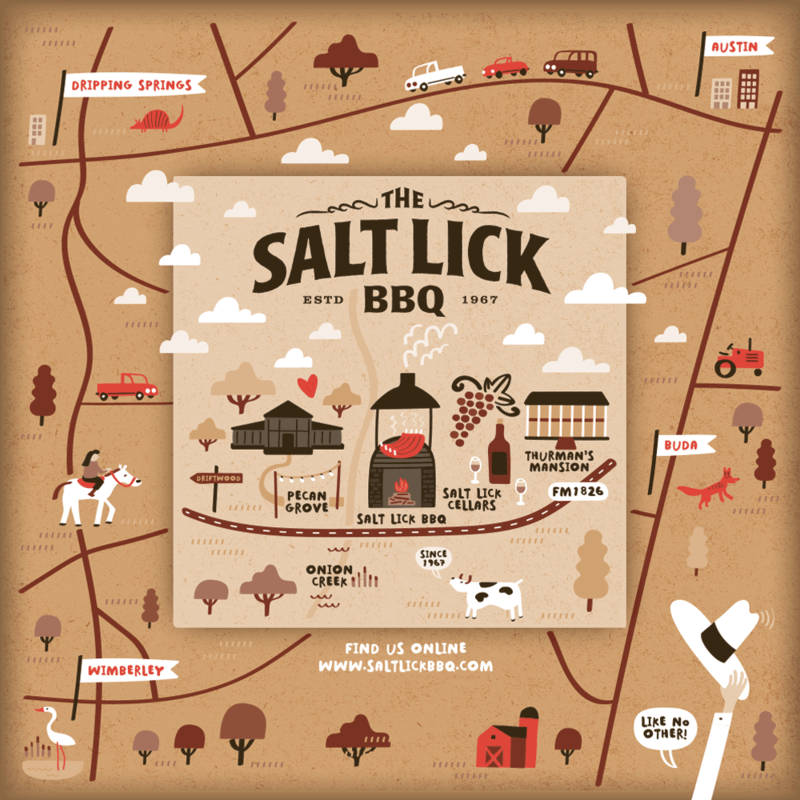 Where did The Salt Lick recipes originate? Just after the Civil War in 1867, the Roberts family loaded their possessions onto a wagon and set out from Biloxi, Mississippi, eventually settling in Driftwood, Texas. On the trip, they barbequed meat by searing it and then slow-cooking it over coals on a pit made with rocks. An earthen berm was created to block the wind and hold in the smoke. Those original family recipes from the Southeast are the basis for what we do now. Over the years, the recipes were “Texafied” taking on the local flavors of the land – like chili, cumin and cayenne. In 1967, one hundred years after the Roberts family settled in Driftwood, Thurman Roberts cleared an area on the family’s land and built a barbeque pit. The limestone used to make the pit was quarried from the land. (That pit is still in use today.) He would start cooking on Thursday night, sleep on a cot next to the pit, and sell the meat until it was all gone. From those small beginnings, we now seat over 800 people and on an average Saturday we feed around 2000 people. 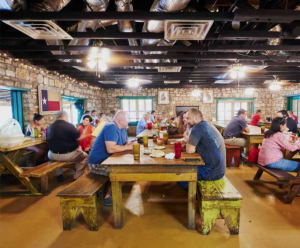 What makes The Salt Lick so unique? The Bar-B-Que sauce has no tomatoes so it won’t burn or become bitter. It does have sugar – a Southeastern tradition – so it will easily caramelize. We sear the meat and then move it away from the hottest part of the fire to cook slowly. We finish our products over an open fire fed by live oak wood. Live oak is the most solid and heavy oak wood. It burns cleaner, more uniform, and the smoke particulates are finer. It gives a more distinct and lighter flavor and doesn’t become gritty on the meat. We don’t use mesquite because it has too much tar in it, and we feel it creates a bitter taste. When the fire flares, we throw into the flames pecan hulls soaked in water. We put sauce on the meat four times. The high sugar and acid content causes it to caramelize on the outside. Basting and caramelizing work to hold moisture in. Sauce drips and hits the coals and the fire flares. The smoke from these flares gives the meat a unique flavor. The first recipes for the side dishes were originated before refrigeration so they come from simple and fresh ingredients. In a normal year we cook over 750,000 pounds of brisket, 350,000 pounds of pork ribs, 200,000 pounds of sausage and more chickens than you want to count. The chicken is the only place we broke from Thurman’s tradition. He would never allow chicken on his pit. Briskets are cooked 20-24 hours and pork ribs 2.5-3 hours. We hold to the hot-and-fast school of thought on ribs. We use high temperatures and lots of basting to keep them moist. The longer you leave them on the fire the more they dry out. They are not like a thick brisket. Sausages are smoked for 3 hours with 45 minutes on direct heat until they swell and spit juice. They are a combination of beef with pork for taste. Ribs are traditional full spare ribs. We stop the cooking process on meats before they are finished and refrigerate them for at least 24 hours. This process increases flavor. It is similar to what you do with spaghetti sauce. The problem with doing this at home is that you have to get the temperature of the meat to 38 degrees within four hours. Reservations for the Salt Lick Driftwood restaurant are available through RESY. For reservations at our Round Rock location, please call the restaurant directly at (512) 386-1044. Our meats have been fully cooked on our famous pits and are then frozen and vacuum sealed. To ensure freshness we ship the meats using FedEx. Same day order fulfillment is not available. Central Texas orders may be shipped via Ground while all other orders will need to be shipped 2nd business day. Next business day is available for many zip codes at an additional charge. FedEx may deliver 9AM – 7PM or later during the holidays. There is no way to determine the time of your delivery, it depends on where you fall on your local FedEx route. As a family run business with deep respect and love for the Texas Hill Country, we enjoy giving back to our community. The Salt Lick provides direct support to the Hill Country Conservancy, The Paramount Theatre, and Friends of the Children – Austin. We give preference to charities that support land conservation and youth in Travis and Hays counties. As a general rule, we do not make charitable donations of any kind to fundraisers or individuals. Visit the pit in Driftwood, Texas. Visit us in Round Rock, Texas.